Although human travel to Mars is still decades away, such a historic space mission could actually happen in your lifetime... if the folks at NASA get their way. But in the meantime, we'll just have to continue to admire the mysterious Red Planet from afar, and as it turns out, Monday night will be your best chance for doing so in several years. 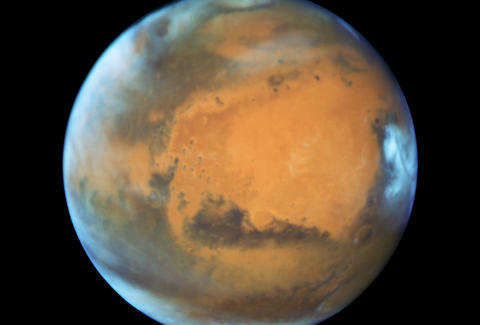 On the night of Monday, May 30th, Mars will make its closest approach to Earth in more than a decade, coming in at a distance of 46.8 million miles, according to a helpful explainer from NASA. This means that Mars will appear much bigger and brighter in the night sky than it normally does, and best of all, it will be easily visibly to the naked eye. In other words, you don't need a damn telescope to see it, although such a tool will give you the most spectacular view if you can get your eyes on one. "Mars reaches its highest point around midnight -- about 35 degrees above the southern horizon, or one third of the distance between the horizon and overhead," the NASA explainer said. "Mars will be visible for much of the night." But don't worry -- if you're too busy drinking and enjoying tons of barbecue food this Monday (Memorial Day), NASA said Mars will continue to appear bright in the night sky through June 3rd. Or, you can always hold out until July 31, 2018, when Mars will come even closer to Earth (and appear even bigger) at just 35.8 million miles from Earth, the space agency said. Now, might be a good time to start saving for a telescope, too. Tony Merevick is Cities News Editor at Thrillist and was utterly fascinated by this stuff when he was a kid. Send news tips to news@thrillist.com and follow him on Twitter @tonymerevick.